Mass in B-flat Major: St. John of God (“Kleine Orgelsolomesse”) Hob. XXII:7, featuring the treble choir from the Baldwin-Wallace University Conservatory of Music, Prof. Jordan Saul conducting. 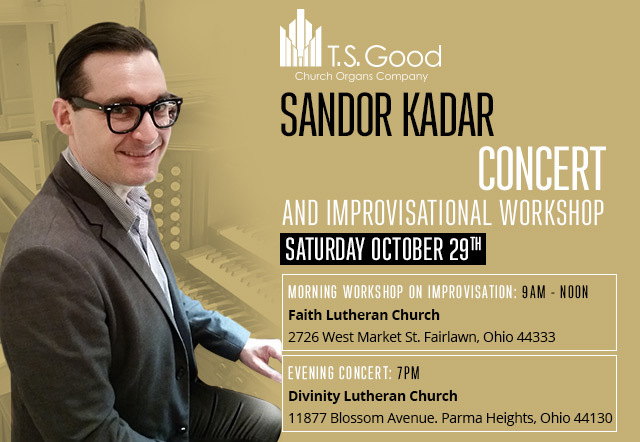 Sandor Kadar Short Bio: Sándor Kádár has been serving as principal organist at First Presbyterian Church of West Chester, PA. Prior to his current position he served at Saint Andrew Catholic Church in Newtown, PA and at Weizbergkirche in Weiz (Austria). In May 2015 he passed the Fellowship Examination of the American Guild of Organists. Last year he was the only person nationwide to achieve the highest level of the AGO’s certification program. In June 2015 he was appointed to be the organist of the World Meeting of Families 2015 and for two Papal Masses. He also played with the Philadelphia Orchestra and accompanied Andrea Bocelli for The Festival of Families in Philadelphia. Mr. Kádár was born to Hungarian parents in Serbia. He has been involved in church music since his early years and accepted his first organist position at the age of 15. He holds three Bachelor degrees in organ performance, sacred music and conducting as well a Master’s degree in sacred music from the University of Music and Performing Arts in Graz (Austria). In 2011 he was a member and accompanist of “Wiener Singverein” (Vienna Choir Association) which gave him the opportunity to work with prominent conductors such as Nikolaus Harnoncourt, Mariss Jansons and Franz Welser-Möst and orchestras such as Vienna Philharmonic, Berlin Philharmonic, Royal Concertgebouw and the Cleveland Orchestra. In 2012 he attended Westminster Choir College in Princeton, New Jersey as an exchange student. As an organist Mr. Kádár has given organ concerts in several European countries and in the USA.